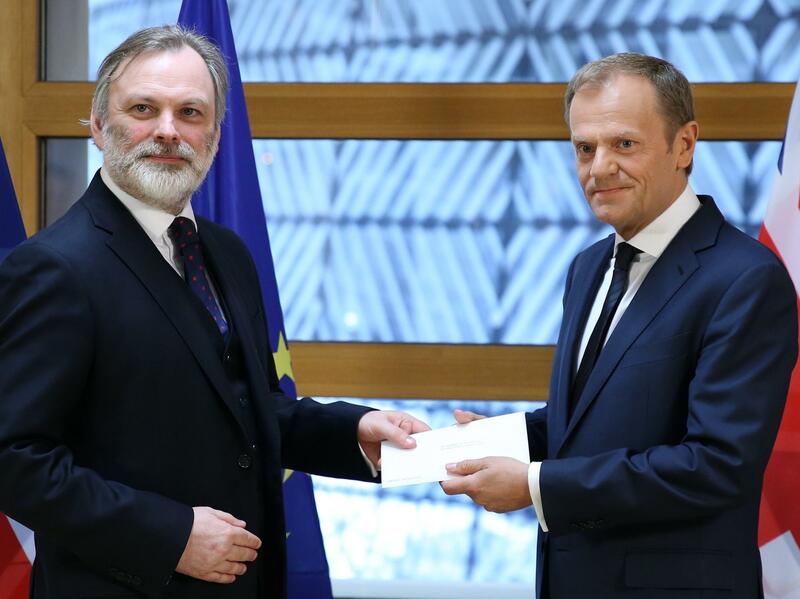 British Ambassador to the EU Tim Barrow (left) delivers Prime Minister Theresa May's formal notice of the U.K.'s intention to leave the bloc to European Council President Donald Tusk in Brussels on Wednesday. Britain's Prime Minister Theresa May leaves 10 Downing St. on her way to the House of Commons in London on Wednesday to speak to Parliament. "The Article 50 process is now underway, and in accordance with the wishes of the British people, the United Kingdom is leaving the European Union," British Prime Minister Theresa May said Wednesday, informing the House of Commons that she has begun the formal process of unraveling the U.K.'s membership in the European bloc. 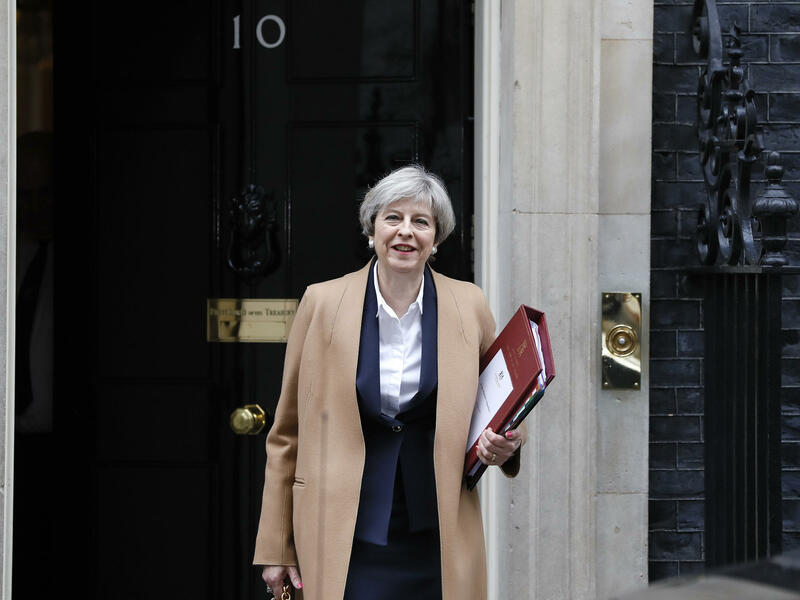 May spoke after signing a letter to the EU that affirms the Brexit that voters embraced last June. She said that letter has now been delivered to the president of the European Council. "This is an historic moment, from which there can be no turning back. Britain is leaving the European Union. We are going to make our own decisions and our own laws. We are going to take control of the things that matter most to us. And we are going to take this opportunity to build a stronger, fairer Britain — a country that our children and grandchildren are proud to call home. That is our ambition and our opportunity, and that is what this government is determined to do." May called the moment a great turning point in Britain's national history, adding, "The choices we make define the character of our nation." Calling for optimism and determination in charting the U.K.'s new course, May said, "I choose to believe in Britain, and that our best days lie ahead." We've updated this post with news from Britain and May's speech. Ahead of her speech, May gave her usual question time — using the opportunity to tell ministers of Parliament, "On today of all days, we should be coming together as a United Kingdom." That sentiment didn't prevent interruptions to May's speech on Article 50. Her remarks on Britain's future were interrupted by an outburst that prompted House of Commons Speaker John Bercow to call for quiet. And moments later, as May spoke of potential cooperation with the EU, she told the chamber, "Perhaps now more than ever, the world needs the liberal democratic values of Europe" — a statement that drew open jeers and laughter from across the aisle. After a pause, May said Britain shares those values, adding, "That is why, while we are leaving the institutions of the European Union, we are not leaving Europe." The British ambassador to the U.S., Kim Darroch, told All Things Considered that he thinks May's future vision is an "exciting one." He added that "the U.K., which has always been open and outward looking, can maintain a very strong relationship with Europe, but a lot of strengthened relationships with the rest of the world." The prime minister's letter triggers Article 50, the exit clause in the EU constitution. Leaving the EU won't be a simple affair: While business and travel concerns often get the most attention, Britain's government will also have to figure out how it will incorporate the thousands of laws and rules that the EU has approved over the years. It's the latest repercussion of a vote that shocked many and forced the resignation of Prime Minister David Cameron last summer. With Britain looking to exit from the EU, the nation may also be forced to contemplate an internal exit of its own: One day before May visited Parliament, Scottish lawmakers voted to back First Minister Nicola Sturgeon's pursuit of a new independence referendum. In 2014, 55 percent of Scottish voters chose to stay in the U.K. — but backers of a new referendum note that conditions have now changed, with the pending exit from the EU. With Article 50 invoked, Britain will have two years to negotiate its self-extraction. Next steps in the process will begin Thursday with the publishing of a Great Repeal Bill. Formal talks could begin by late spring, but before a deal is enacted, both houses of Parliament will need to vote on it.